This week’s recipe is meant specifically for a couple occasions we all encounter. For example, that awkward moment when your neighbor, friend, or in-law has a get together and you foolishly offer or get suckered into bringing something. Or those sad Sunday nights when you regret not buying any ice cream at the grocery store and suddenly have an aggressive appetite for something sweet (and are too lazy to go to the store and buy some). Banana bars to the rescue! This recipe calls for ingredients you always have in your pantry, especially over-ripe bananas, and is fool proof for any baker or non-baker alike. 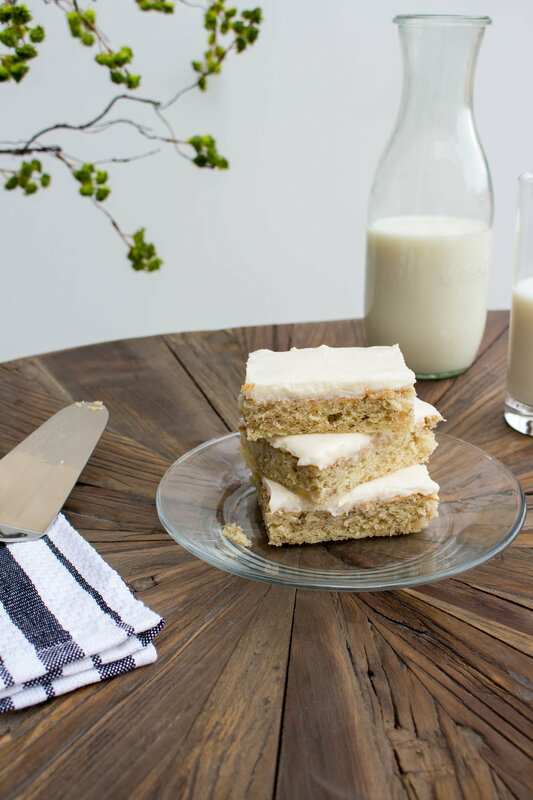 These banana bars can be dressed up or down depending on the occasion and will satisfy anyone at a party (unless they’re gluten free party poopers) or just hit the spot when you need something special while binge watching Netflix. Preheat the oven to 350 degrees. Grease and flour a 13×18 sheet pan. Sift flour, baking soda and salt in a bowl, set aside. In a separate bowl using a hand mixer, beat together butter and sugar until creamed. Add eggs, sour cream and vanilla extract, beat on medium high speed until mixture is smooth. Add dry ingredients to wet ingredients and mix on medium speed until mixture is combined (do not over mix). Using a spatula, gently fold the mashed bananas into batter then evenly spread into the greased baking sheet. Bake for 20-25 minutes. In the meantime, cream butter, cream cheese and vanilla on high speed. Add powdered sugar one cup at a time until frosting reaches desired consistency. Spread evenly onto the cooled sheet pan. Cut into bars or eat with a fork out of the pan (like I do). Serve with cold milk and enjoy!